Last December, Clark sent out a mailing to the "usual suspects" (those who have traveled with him before) announcing this proposed trip. By mid-February, just as I was ready to leave for my Switzerland railroad tour, the details were firmed up and the trip was a likely "go" so I quickly signed up. As time got closer I made arrangements to fly to Dallas-Fort Worth on Memorial Day, and back to Pittsburgh from Minneapolis on June 7. Then it was a matter of waiting. Well, not quite. Over the four years I have designed custom polo shirts for the various High Iron Travel trips that have run. The shirts have maps of the route on the back, and a trip logo on the front. 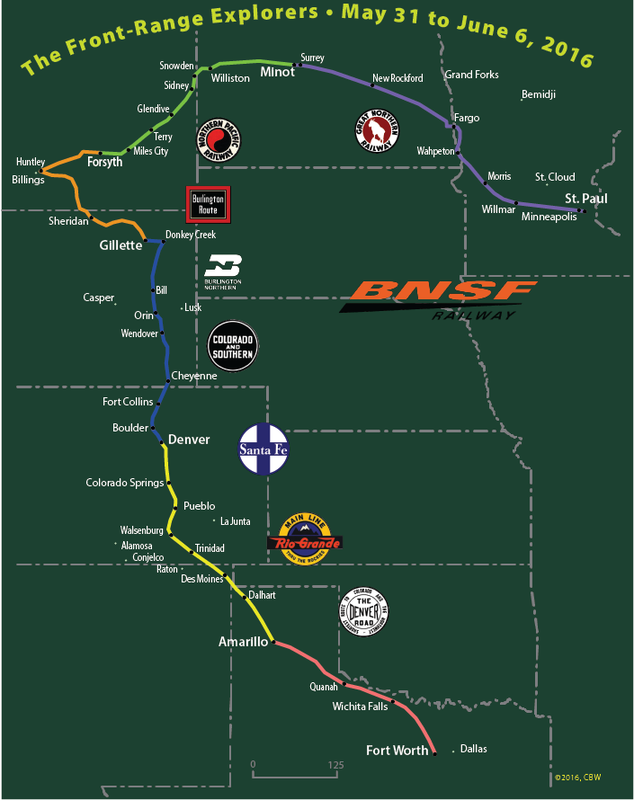 Since the map will show you the route of the trip, I reproduce it here. On May 30, I took a bus to Pittsburgh International Airport, cleared security in less than 5-minutes (thanks to TSA Pre-check), and waited for my American Airlines non-stop to DFW. It both left and arrived on time and I was off the plane by 1:40pm. 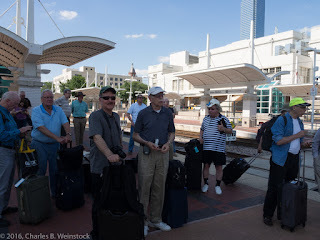 Some friends, Rich Copeland and Rob Mandeville, had agreed to meet me so that we could share an Uber to the Fort Worth Intermodal Transportation Center where we would board the train. 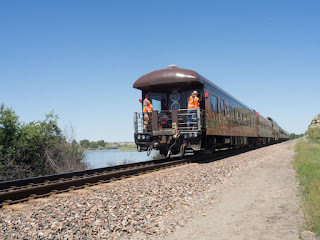 The day before, the cars and locomotives that would make up our private train left Chicago on the rear of the Texas Eagle. That train was due in Fort Worth around the time we would arrive so things would work out great--except the train was running late. That actually worked to our advantage as the three of us were able to take the DART (Dallas rapid transit) to Dallas Union Station (for all of $1.25 each) and board the train there after about an hour wait. This allowed me to settle into roomette 121 in the Cimarron River well before arrival in Fort Worth. Dinner was off the train and a handful of us went to a nice place, The Little Red Wasp where I had a very good shrimp and grits dinner. Our train consisted of two Amtrak locomotives, four sleeping cars, a dining car, a full-length dome car, and sleeping/open platform observation car "Caritas". All but the Amtrak locomotives and the sleeping car Cimarron River were painted in Illinois Central Railroad brown and orange. Bright and early on May 31 we pulled out of Fort Worth headed for Amarillo, TX on the BNSF Railway (formerly called the Burlington Northern and Santa Fe). 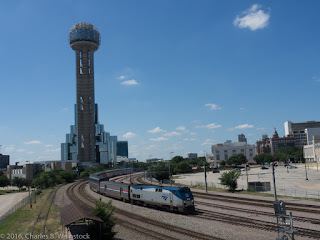 I had ridden the first part of the trip, from Fort Worth to Quanah as part of a convention of the National Railroad Historical Society in 2008. After a good breakfast of bacon and eggs in the diner, we settled in for the long, hard day of watching the scenery glide by punctuated by lunch in the diner, and dinner and the diner, not to mention an afternoon restorative around 4pm. 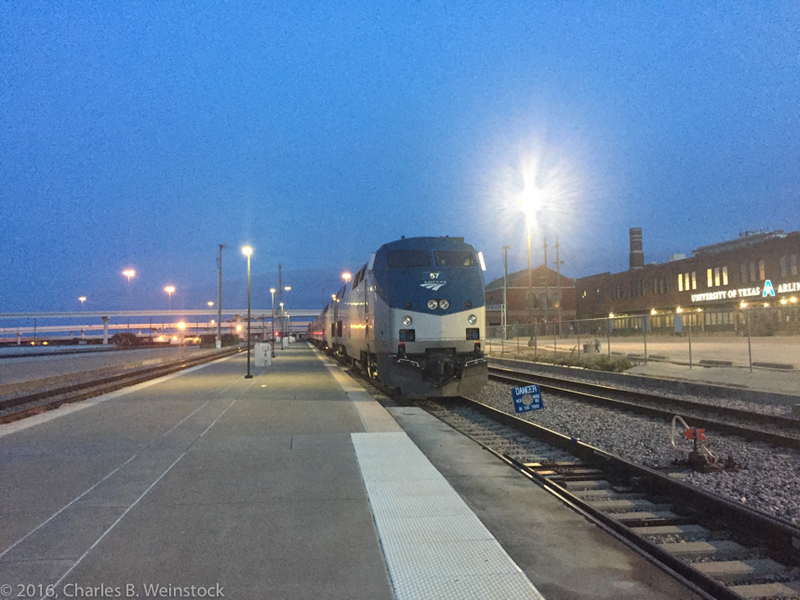 After passing through a torrential rain in Wichita Falls, the train arrived in Amarillo and some of us took the opportunity to walk around before calling it a night. 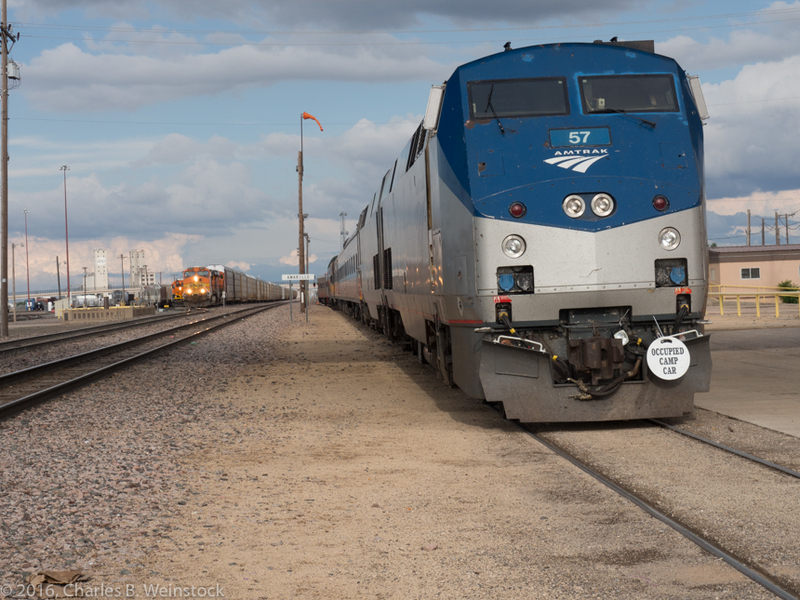 On June 1, we headed from Amarillo to Denver via Dalhart, TX, Trinidad, CO going part of the way on the "Joint Line". 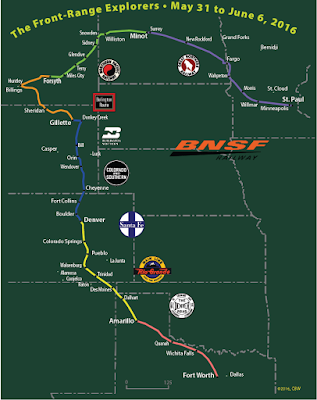 The Joint Line gets its name because it is jointly owned by the Union Pacific (via it's purchase of the Denver and Rio Grande Western), and the BNSF. I had ridden all of this route on several previous trips, but it was well worth doing again. 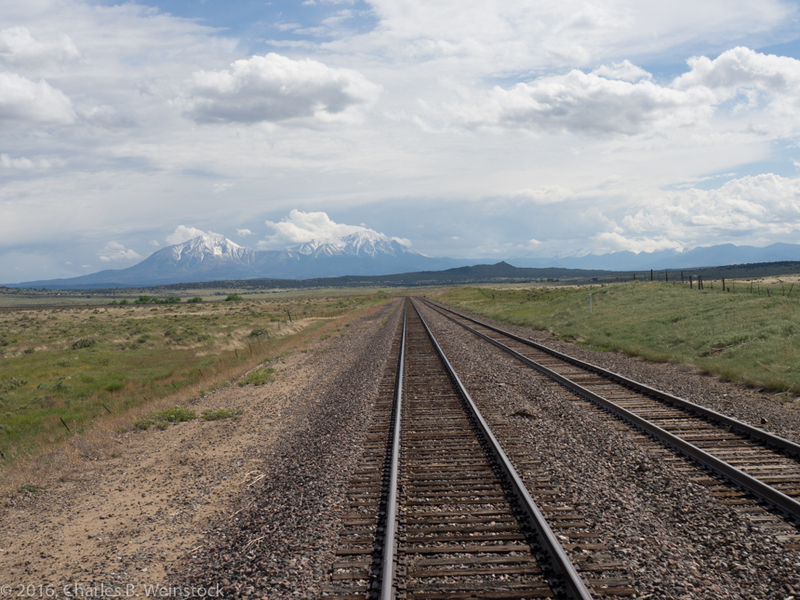 It was a beautiful day and I spent a few hours sitting on the rear platform enjoying the fresh air, the comfortable temperatures, and the mountain views. Due to a delay leaving Amarillo and some delays along the way, we arrived in Denver a bit late...after dark...where we were to spend this night and the next parked in Denver Union Station. 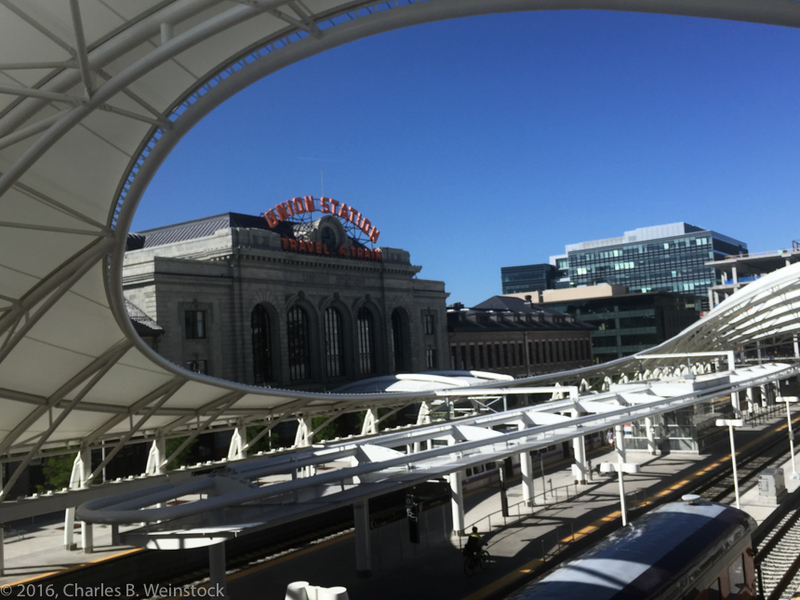 Denver was an off-day to give the crew time to restock the train, and the passengers time to explore Denver. In the morning a bunch of us rode the newly opened rail line out to Denver International Airport and back. Then we had lunch with local friends Joe McMillan and Steve Patterson at Union Station. At some point John Arbuckle from Hutchinson, KS joined us. He would be riding the next day to Gillette, WY and then returning to Denver by a rental car. 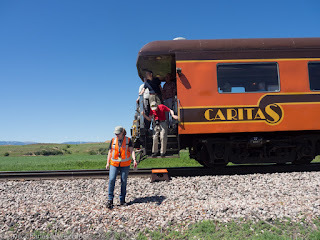 After lunch, Joe took Dave Ingles and I out for a quick drive to a grade crossing on the airport line we had just ridden so that we could get a picture of a train. A rather officious wanna-be highway official tried to shooed us away but not before we could snap a few photos while standing on public property (the sidewalk). After Joe dropped us back at the station we reboarded the train for an afternoon of relaxation. At 5pm a friend from the BARGE poker community, David Lawful, came into town to meet me for a beer. I gave him a tour of the train and then we went to a brew pub across from the station. Friday, June 3, was a major highlight of the trip and represented a significant rabbit for Clark. 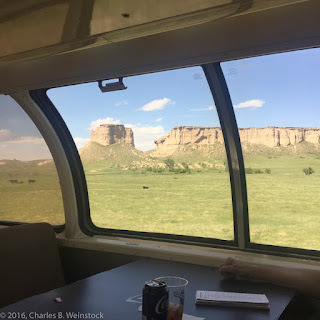 We traveled from Denver to Gillette, WY via the Powder River Basin coal line. I've written about this line before, so I will not describe it here. Due to a fairly massive decrease in coal traffic, this mostly mostly three but sometimes four track line from Bridger Jct. to Donkey Creek has significantly less traffic than when we visited in 1994, but it was still quite impressive. 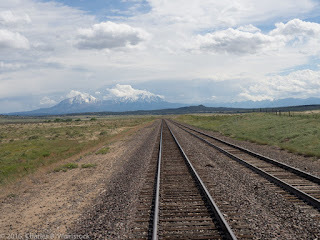 Perhaps more impressive, we were the first passenger train over this line (constructed mostly from 1972 to 1979) not counting official trains on railroad business. We probably wouldn't have been able to do this except for the decrease in coal traffic. Before reaching that line we traveled through Boulder, Fort Collins, and the Wendover Canyon. Due to some slow running and delays we arrived at Gillette just as the last (very faint) rays of daylight were disappearing. Surprisingly we were able to see most of the line in near-full daylight. I'm picking up the narrative here after having arrived at Amtrak's old Midway station (so-called because it is midway between Minneapolis and St. Paul) where the Front-Range Explorers trip terminated. Shortly after returning to the train after the Dairy Queen visit, the head-end power (HEP) failed. 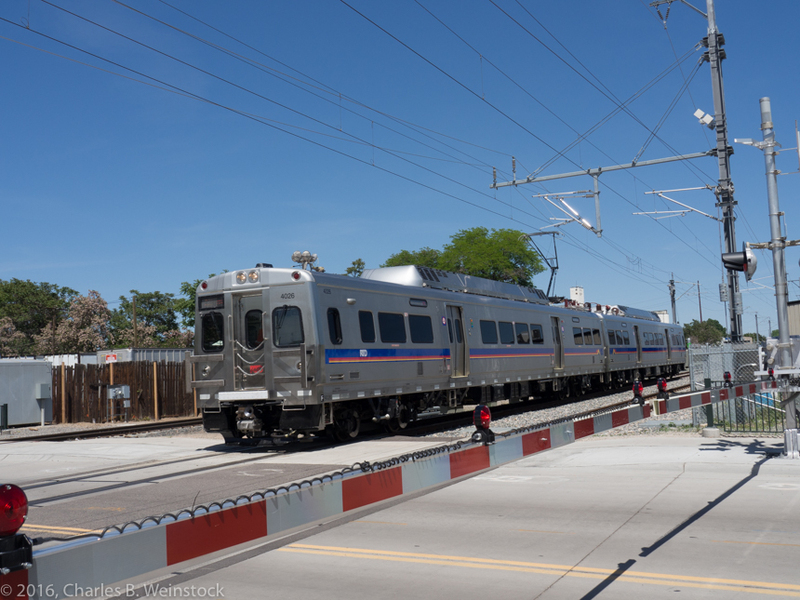 HEP provides electrical service to the entire train. This was not a good thing. It would periodically come up for about 5 seconds as they tried to restart it, and then go down again. Finally it came up permanently. It turns out that the second of our two locomotives ran out of lube oil and had shut down due to overheating. The solution was to switch to using the lead unit for HEP. 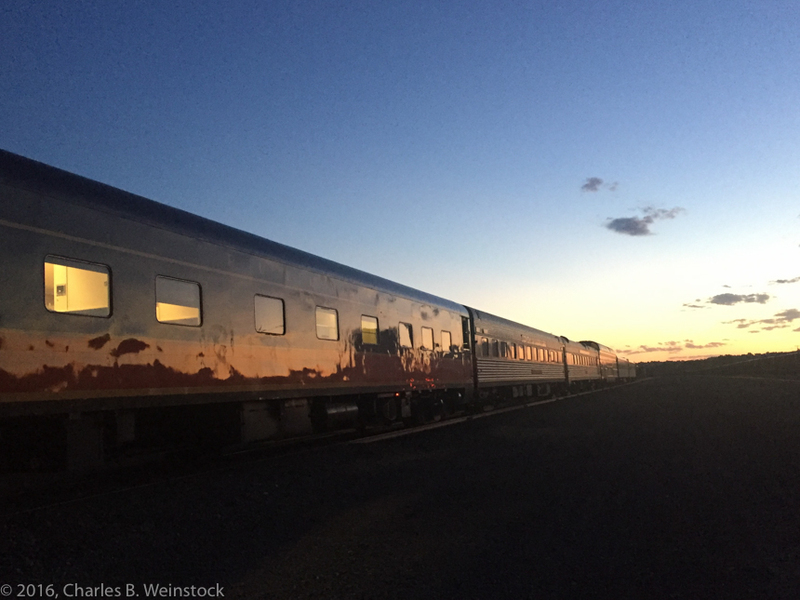 Luckily one of our passengers was an Amtrak engineer from California and knew exactly how to do that (the Amtrak crew was off in a motel for the night.) By the way, the reason we had two locomotives for a relatively short train had to do with Amtrak desiring redundancy far off their normal routes. As mentioned in the opening, Sunday, June 5 was an amazing day as we traveled between Forsyth, MT and Minot, ND over some very rare mileage. It was a beautiful sunny day and the slow speed over much of the route was highly conducive to taking in the rays and shooting pictures on the rear platform. 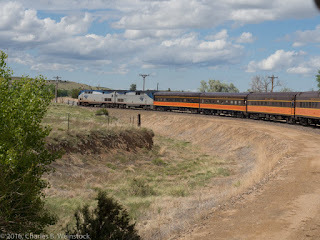 We arrived at Snowden, MT at a junction with the main BNSF line in the early afternoon. Since we were overnighting in Minot, ND -- where we would have to water and otherwise service the train in the depot, there was some concern that we would have to wait for Amtrak's Empire Builder to pass before we could continue on. This would have made for a very late arrival. But we were so early that we were able to leave Snowden almost immediately after a crew change. After servicing in the depot as scheduled, we pulled East into a yard across from a speedway well ahead of the Empire Builder's arrival. Dinner was in the lower level of the dome as the diner was oppressively hot. Monday, June 6 was the last formal day of the trip. We left Minot in the middle of the night (3:15am) so that we could make Minneapolis before the afternoon commuter rush (or perhaps it was so that optimists could make early evening flights). I was a bit concerned about how well I would be able to sleep while the train was in motion (when traveling overnight it usually takes me a day to get used to the motion) but I need not have worried. Except for waking up briefly when we left Minot, I slept as well or better than I had any night of the trip...getting up about 7:30am. At this point we were well into another "rare" part of the trip. We were scheduled to take the Surrey Cutoff from Minot to Fargo which is not the usual Amtrak route but, due to flooding, has been used often enough that most of us had already covered it. We did, but instead of turning right at Nolan ND to Casselton and then up to Fargo (as is the usual practice) at Nolan, ND we continued straight ahead on the Propser Subdivision towards Fargo. This had been set up only the day before when Clark realized that it would be interesting to do so! From Fargo we headed south to Breckenridge, MN on the Moorhead Subdivision, and then East through Willmar, MN onto Minneapolis. 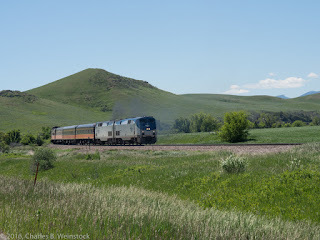 I was not sure whether I had this route or not because, in the early days of Amtrak, they kept switching between this route and the current route. Now I am sure. We arrived in the Minneapolis area just before the 4pm rush hour start and were in Midway station, shortly thereafter. 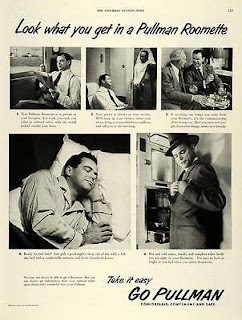 Many of the passengers elected to stay on the train that night and either get off in the morning to catch a flight home, or stay on to Chicago after the cars were attached to the end of the Empire Builder. I and others elected to spend the night in a hotel prior to our flights on Tuesday. After saying goodbye to friends, three of us caught an Uber to our various hotels and then, took another Uber to meet up at a restaurant for dinner. Due to a momentary surge in Uber pricing, we used a Lyft driven by a very unusual tattooed young lady back to the hotel, arriving before 10pm and in bed by 11pm. Surprisingly slept better most nights on the train than I did in the Hilton. Tuesday morning I awoke ahead of my alarm at 7am and was at the airport by 8:15 for my 10:00am flight home. I had heard horror stories about lines from friends who fly regularly out of MSP, but was through the TSA Pre-Check line in less than five minutes (and it didn't look like the non-Pre-Check line was moving much slower.) My flight was uneventful but bumpy as we neared Pittsburgh. I caught a bus to the CMU area and another to few blocks from my home and walked in the door just about 2:30pm. It was a great trip and I hate to think that it is the last such trip. I am sure something will come up in the future. 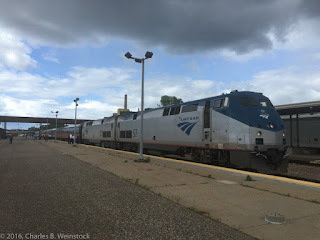 The cars that made up the Front-Range Explorers were added to the Empire Builder at Amtrak Midway, went on to St. Paul itself and left there 1 hour and 32 minutes late. Arrival, for those who stayed on to Chicago, was 1 hour and 37 minutes late at 5:32pm.